Change is afoot - and to be honest, when isn't it? We always have our radar up and our ears to the ground because the DAM industry is ever evolving. Not always at the speed of light, but as a vendor & partner in this space, it's never ok to take your eye off the ball. We always want to bring the most value to our customers, so when it comes to planning, we listen to our customers first and foremost. What are their common frustrations? Which processes are they repeatedly mentioning and which new technologies are sparking interest in THEIR industry? We also take time to listen to industry experts and Theresa Regli, one of the DAM industry superstars and woman with her finger on the pulse launched 2019 with her predictions for the future of DAM over this coming year. We loved this insightful presentation and thought we'd take a couple of points from the webinar to discuss in more detail. We're going to take a look at three of the topic that were raised in the webinar and see how they fit alongside our way of thinking and our approach to DAM in 2019. 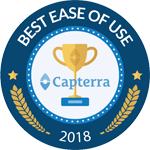 We don't hide the fact that we're proud of our user experience and strive to make Asset Bank easy to use for users and administrators alike, so much so that we received this award from Capterra in 2018 for 'best ease of use' - but is this is all for nothing if we're entering the age of the API? All for naught in 2019? Of course, usability isn't going anywhere. People will still be interacting the with the DAM in one form or other, and making sure the process is quick and easy is a great way to ensure the user comes back next time, rather than squirrelling away assets on their hard drive for next time. The trend that API is being a key part of a DAM system is definitely a trend we're noticing as more and more of our clients are utilising our API to integrate with other systems and improve connectivity throughout their organisation. In recent months we've re-written our documentation to improve usability and are working to add functionality to expand the way that Asset Bank can work as the 'hub' of a digital ecosystem. How well do your different applications and processes fit together? [/caption] When selecting a product it is important to consider how the new application will fit into your suite of tools. In some cases, especially for small to medium size organisations, having an application with a great user experience is all you need, as there isn't a sprawling array of systems that need to be linked into each other. For enterprise clients, ensuring that your products have an API that is workable by your in-house teams is more of an important consideration. How should DAM practitioners get ready for 2019? "Make sure you have technology that's fit for purpose. Once you do, stop obsessing about your system." That's right - a software vendor is writing that software isn't everything when it comes to ensuring your DAM implementation is a success. It's easy to be drawn to companies with the longest feature list but often this isn't the most important thing. Making sure the features that you need are included and easy to use is often more of a relevant consideration than having a huge number of features which aren't needed by your organisation. There are so many choices of vendor - and there's no "silver bullet"! "You should spend three times as much on staff augmentation and metadata efforts compared to the tool itself." Working to ensure your DAM is in tip-top condition is an ongoing task, and when a system falls out of favour it can often lead to a significant re-configuration and re-launch project in order to obtain buy-in from your users and restore the benefits of your system. The list of DAM-related job titles grows year after year as the practice becomes more recognised as a valuable part of the marketing team, rather than simply busy-work that can be handled by an existing team of creatives. From our perspective, we are working with clients on larger and more complex projects each year as requirements and expectations become more mature in this growing industry. Whether your organisation chooses to employ in-house DAM specialists or rely on external consultants and support from your vendor, it is important to ensure this human element is factored into your budgets. Even the best-configured system will, over time, become less relevant less useful as your organisation requirements and structure changes. We saved discussing this trend for last as it's an interesting topic that is hard to pin down the reason for. We'll be honest, throughout 2018 we've seen organisations move away from Asset Bank to other vendors, and we've equally seen organisations move to Asset Bank from other vendors. What gives? In some cases, churn is a result of new requirements that simply aren't met by a current software package. Different products have different strengths, and there's definitely no "one size fits all" in the world of DAM. However, when working with some of our clients who have been on the fence of moving to a new product we've realised that the appeal of a new product is often a result of "the grass is always greener". This is especially apparent if the usage of their existing product has fallen by the wayside - meaning latest features and improved services aren't common knowledge. So - how can we fix this? Moving between vendors is a time-consuming and expensive activity, especially if the end result has similar functionality dressed in a different vendor's outfit. The simplest advice we can give to improving your DAM utilisation and effectiveness is... talk! Talk to your vendor, talk to your users, talk to your administrators, and start to understand the alignment between what your end users are looking for and what the vendor can offer. There may some golden features available that simply aren't being utilised, or possibly work on your current structure will result in a more effective solution for your users. What else should I be thinking about in 2019? Well, the next Game of Thrones starts in April, so that should definitely be on your radar... but within a DAM context, if you're interested in learning more we'd recommend giving the full Henry Stewart Webinar a listen. Maybe you'll pick up on a few golden nuggets that we missed! If any of these topics have caught your eye and you'd like to talk to us then please get in touch!